Seeking to bolster their chronically sparse representation on the state's highest courts, seven Latino voters are suing Texas to challenge the state's longtime method of electing judges statewide. The state’s most powerful courts don’t exactly resemble the population outside of their chambers. Though Latinos make up more than a quarter of the state’s voting-age population, just one — Justice Eva Guzman — sits on the nine-member Texas Supreme Court. The same goes for the nine-member Court of Criminal Appeals, where Judge Elsa Alcala resides. Seeking to bolster their chronically sparse representation, seven Latino voters are suing Texas, arguing that its longtime method of electing statewide judges dilutes the voting power of a rapidly growing racial group. For more than a century, judges on the state’s high courts run have run in at-large partisan elections, vying for votes across the state. They serve staggered six-year terms. In a bright-red state like Texas, that voting system yields staunchly Republican courts, limiting election drama to primary races. The plaintiffs — six voters in Nueces County and one in El Paso — argue that the current system prevents Latinos from choosing the candidates they prefer. Latino candidates would more consistently nab places on the courts, they suggest, if Texas carved up the courts geographically, creating single-member districts. The lawsuit named Texas Gov. Greg Abbott and Secretary of State Carlos Cascos as defendants. Their offices declined to comment. The office of Texas Attorney General Ken Paxton also declined to comment. Texas is one of just six states that elects its justices though partisan elections. And two of those states — Illinois and Louisiana — divide their courts into geographical districts. 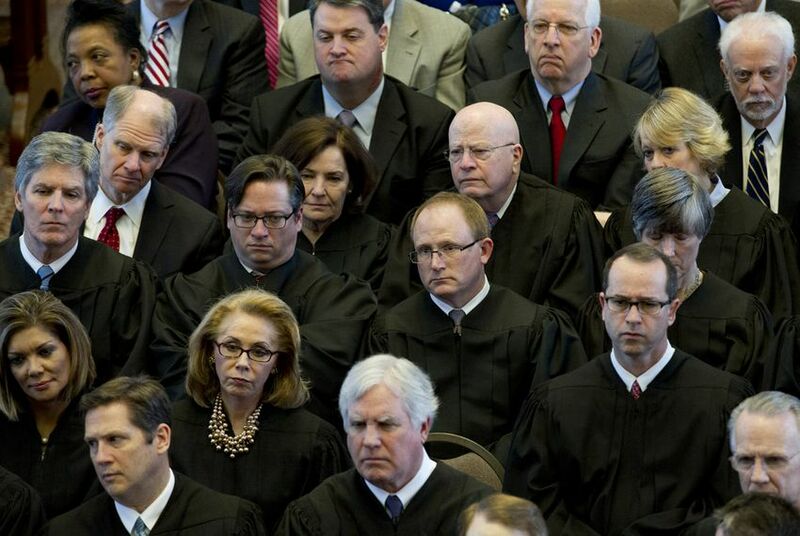 Since 1945, 69 of the 76 justices to serve on the Texas Supreme Court have been white. Five were Latinos, according to the lawsuit. Over the same period, 44 of 48 Court of Criminal Appeals judges were white. Just two were Latino, according to the suit. Even the two Hispanics currently on the courts — Guzman and Alcala — were not originally elected to their seats. Both were first appointed by Gov. Rick Perry to fill vacancies. In fact, no Latino has ever been elected to those courts without first being appointed to their posts. Guzman did not respond to a request for comment. Alcala, who sits on the Court of Criminal Appeals, knows the optics could be better. Many of her cases involve Latino and African-American criminal defendants, but she’s the only person of color on her court. She does not take a position on the new legal challenge, but she did suggest another option for bolstering diversity among top judges: allow governors to appoint all them, with voters later deciding whether to retain them. Perry appointed Alcala to the court in 2011. She won a new term in 2012 after running unopposed in the Republican primary. And on her court? She got lucky. "There just haven't been vacancies," Alcala said. The lawsuit alleges that the current system violates Section 2 of U.S. Voting Rights Act, which bars governments from drawing up electoral districts that discriminate against racial groups. “This is just the next step to get Latinos to the table and bring the promise of the Voting Rights Act to fruition in Texas,” Garza said. But one former Texas Supreme Court Justice — Steven Wayne Smith — said that electing the state's justices by geographical districts could prove problematic. “The court has to represent the whole state, so the normal remedy of dividing the area up into one-person districts is just inconsistent with the judicial branch,” the one-term Republican said. “What do you do if one of your constituents in your district is suing someone in another district?" Opponents of the current system say such concerns are overblown. Challenges to at-large districts have helped Latino and African-American voters gain a foothold on other political bodies: city councils and school districts, for instance. To succeed, the plaintiffs must prove that Latinos are a “politically cohesive” voting group and that a white majority regularly defeats their preferred candidates. Voting rights experts say they cannot recall any other challenges to the way Texans elect their justices, but opponents of at-large elections have successfully challenged them in other contexts. In 2002, for instance, the U.S. Department of Justice thwarted a proposal in Freeport to abandon its single-member city council districts in favor of at-large elections. In 2013, Farmers Branch elected its first Hispanic city council member — one year after a federal court struck down its at-large electoral system. Opponents over the years have also challenged at-large elections in Texas school districts, with some success. Lone Star College, for instance, ditched that method for selecting its board members after voting rights advocates sued in 2013. In 1991, the U.S. Supreme Court ruled that the Voting Rights Act could apply to elected judges — at least in state trial courts. That decision was part of a long-running challenge to at-large judicial elections in 10 Texas counties. That convoluted legal saga sparked drama in Austin as two consecutive Texas attorneys general wrangled with Chief Justice Tom Phillips and district judges over how to handle the dispute. “The political backstory in that case was fascinating, full of vintage Texas political intrigue and Capitol strategery,” Don Willett, a Texas Supreme Court justice since 2005, said in an email. The Republican justice, who has been mentioned by Republican presidential nominee Donald Trump as on his short list for future nominees to the U.S. Supreme Court, said he could not comment on the latest challenge to Texas judicial elections. “But as a political matter," he added, "It'll be interesting to watch from a safe distance."